Этот квест начинает длинную цепочку, по окончании которой вы сможете зарабатывать репутацию у фракции Сыновья Ходира. Это не совсем правда. В деревню можно дойти и пешком, но это довольно сомнительное развлечение, поскольку придётся обойти почти весь континент по периметру. Придётся прыгать с высоты, так что лучше иметь левитацию или аналоги. Возможно есть путь и совсем без падений, но я не в курсе. Если кому-то хочется проверить, то от К-3 надо идти на запад к крепости часовых в Ледяной Короне. В крепости держаться правой стороны, получится выйти примерно в направлении северо-запада. Там опять идти и внимательно, смотреть направо, искать дорогу наверх в горы, которая идёт по Рохемдальскому (кажется так, пишу по-памяти) проходу и выходит к валькириям (не к Валькириону!) северо-западнее Ледяной Крепости. Далее по дороге можно продолжить идти на северо-восток и выйти к реке Бора. Там налево, на северо-запад к Валькириону. Через проход на север выйти на Снежные Поля и идти по правому краю до прохода к Библиотеке. Потом за восток к Террасе Магистров. Пройти по лестнице на юго-восток. Потом на восток и прыгаем/падаем вниз. Идём по тропе, которая есть на карте, на юг через лагерь Бранна и попадаем в Долину Древних Зим. Там на юго-запад/запад чтобы попасть в деревню и наконец через рудник в ту часть, где стоят клетки. Фуф, утомился. А в общем-то главное, это иметь шило в известном месте. а какой кв идет после этого. Я его сделал и дальше в к-3 ток кв есть полет вдохновения((( Где дальше кв найти? В квестах цепочки указано только для альянса ? это так? стоит ли вообще начинать? 1. Они забрали наших мужчин! за эту лажу дают репу? Очередная пасхалка. Хильд - имя одной из скандинавских валькирий, переводиться не иначе как "воительница". Да и многие имена валькирий ВОВ созвучны или совпадают с другими именами скандинавских валькирий. как обычно ни одного полезного комента, кто поскажет какой преквест? Goblin prisoner cages can be found around the Sifreldar Village at 41, 70. Keys to the cages drop off the local storm maidens. 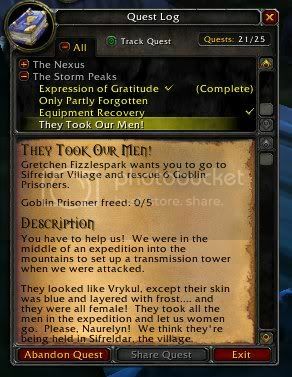 I'm pretty sure this quest is in reference to the south park episode where the old people are running around going "THEY TOOK OUR JOBS"
Is that 5 or 6 Goblin prisoners we have to rescue? Seems to be a mismatch somewhere. If a site mod is reading this, this quest isn't alliance only as stated in the quick facts, it can be accepted by both factions. You can just remove this post once you make the change. only if those Vyrkuls started doing goblin work... then it would be the southpark reference. This feels more like the futureamma episode where the amazon women caged spif, fry, bender and the captain dude for death by snookie. I'm pretty certain this is a bit more basic than a South Park reference. There are only tales of Amazons or similar warrior women stealing men in about half a dozen different cultures. Y'all might want to consider reading a book now and again. I mean, she is a female and goblin is the most 'urban' of the races. These people from the FUTURE! took our jobs! Everyone back to the pile! I'm unsure if it was just me and my poor luck, or the way they're currently flagged 'quest item' instead of 'quest (unique 5)'; but I only ever got 1 key at a time no matter how many I killed. After I released a goblin, I would get a key on my next or second next kill. Seriously, how ignorant can someone be to think first of South Park when seeing a quest about Amazons stealing men? Dey took our men! Dey tok er men! Unsure if this is happening to anyone else. But once you acquire a key from the mobs and attempt to gain another one it does not refresh your current amount. Only allowing you to carry one key, but taking any you may pickup along the way. In order to reach the area needed you will have to fly. Not flying in Northrend yet? No problem, just talk to Honest Max right by the fp to get a loaner flying mount. You can definitely have more than one key at a time. It could very well be that this has been hotfixed since I've been through on my mage which wouldn't surprise me, there's been at least 3 serverside hotfixes since I completed this quest. Lol is this a typo? Description: "Gretchen Fizzlespark wants you to go to Sifreldar Village and rescue 6 Goblin Prisoners." But the objective says to free 5 of them. I sort of thought of that too. Not so sure. The Futurama reference is definitely stronger, but I think this is there too. This is a must-do quest! It leads to a long, fun and ultimately necessary chain to eventually get rep with sons of holdir. They sell the new shoulder inscriptions, which everyone is going to want to get eventually, so don't pass up this quest. In order to get this done most quickly & efficiently I went around killing the Storm Maidens & collecting the Cold Iron Keys, by the time I had 5 keys I had all 8 Recovered K3 Equipment for the "partner" quest mentioned above. Then just save the goblin men on your way out. Kill Sifreldar Storm Maiden, Sifreldar Runekeeper for keys which is used for the rescue 6 Goblin Prisoners in The Storm Peaks 40,70 around here. Heh, free 6 Goblin Prisoners. To anyone who does this quest chain I HIGHLY recommend reading these quests, not just doing their goals. The story/lore of it is superb, and should not be passed up. On top of that you unlock the Sons of Hodir Rep, for shoulder enchants (they are the scryer/aldor equivalent for LK) and other goodies. This quest is the start of the quest chain to open up The Sons of Hodir Faction. Anyone know why i cant pick up quest from gretchen? im lvl 80 and @ K3. I find it funny that when you release them they say: "Yes! Im finaly free to go!" DUDE, you are on the biggest mountain ever XD! How are you going to get down XD? All of our boys are back... thanks to you, <name>! Well... all but one. My brother Zeev is still up there according to the others. Apparently they have some sort of mine where they make their prisoners work. Go in there and see if you can find out anything. One of the best story lines in World of Warcraft. Leads to why Thorim became a boss in Ulduar. I think it's a lot simpler than that. Usually when armies raided places they stole the women. This is an army of women who stole the men. So instead of "They took our women!" it's "They took our men!" Hi, I'm lvl 80 and I'd like to start this quest chain but the quest giver doesn't have the quest for me.. I am currently hated by "The Sons of Hodir". What do I need to do to start this quest? I can't seem to get the quest does anyone know why? I go to the quest giver but she doesn't have it for me. Just got around to doing this quest on my alt. Pretty sure I had the quest the other day and abandoned it to make room for Oracle daily's. Now Gretchen doesn't offer the quest anymore. I bet that's what happened to the other folks in this thread that can't get the quest probably had it at one point, and abandoned it for what ever reason. You need to make sure you pick up the slag covered metal and start the quest like that it begins. you have to kill 10 of the elementals around the anvil, and then turn that in to Thorim too. After that, and the chain up above, you should be in good shape. Actually I think you'll find it's pronounced a little more like: DEY TUK OUR DJURBS! Possible reference to south park: they took our jobs! this chain will give about 210,000 xp when finished, not counting the xp from kills. as others have said if will lead u to start rep for the sons of hodir, for their rep items. Is there a prereq for this quest? Hey guys. I did this long Q, to get the shoulder enchant, and at the end, listening to that big guys story, I got 22k rep with em'. But i'm still hated, halfway in. So what do I do? As of 3.3, after turning in A Spark of Hope (28600 rep) and Mending Fences (28600 rep) you will end up on 6200/12000 Honored. This makes the reputation farming to Exalted way much easier, since you only have to work from half Honored to Exalted, instead of Neutral to Exalted as it was before patch 3.3. So, giant blue amazon women pillage a town and steal the men. Were I them, I believe I would have gone a bit farther out of my way in order to avoid a goblin town. I'm trying to get to the Honoring part of Sons of Hodir to get the glacial bag lesson. But this quest thing is making my rep with them to hated... How is this quest going to help? The South Park episode is definitely the first thing that came to mind when reading the quest title. That may be because Trade chat has the occasional "THAY DOOK ARE DERBS!" spam. I finished this quest chain with Mending Fences only to be told I was now hated with Sons of Hodir. I tried googling for help, but no-one had a straight answer they all wanted to talk about how much they own, or how easy it was blah blah YAWN! Anyway, if you are like me and have finished the chain and are hated, then don't worry because it's only something you missed. There is an additional quest you must do which is found, ironically enough, when you are doing part of the actual quest chain. Whilst killing Stormforged Iron Giants, one of them will drop an item called Slag Covered Metal. If you do not have this in your bag, then go kill more giants until you do. This item begins a quest called The Refiner's Fire and is the beginning of a two quest chain of its own. The Refiner's Fire quest starts with the Slag Covered Metal and ends at Fjorn's Anvil. Once completed you will be given the second quest in the line which is called A Spark of Hope. All you have to do for this is fly back to Thorim and turn it in. If you are hated, like I was, completing this chain will bump you straight to honored with Sons of Hodir. so maybe it's only available at 77 or such ? I wonder how they reproduce if they are all female? can you do this quest without a flying mount? -You're implying that a group composed entirely of female animals will... breed? -No, I'm simply saying that life, uh... finds a way. - #1 = The lawer representing Jurassic Park's investors. One of the Jurassic Park Geneticists. The first Jurassic Park movie/book is where he got the quote, for those who didn't figure that out. Edit: Eleet11 is indeed correct, had it wrong.... :( Fail on my part. Might seem obvious but you can't loot the keys if you're in a raid (say like one directly after Wintergrasp). Wrong. The lawyer did not make that statement. That line was said by one of the Jurassic Park geneticists when the raptor egg hatched. Who finished 23Quest line, still cant find Lillehow, must complete this two quests, droped by mobs on lake. This quest chain rewards 30-32k rep to the Sons of Hodir as a Human, for other races it will reward 28-30k instead, so other races, unless you got rep increasing perks, you going to be at halfway Honored instead of fresh start at Revered. Getting rep perks as a Human is just overkill.. Remember turn enable low level quest tracking if you're well above the level requirements. At exalted with Сыны Ходира you can buy two extra mammoths, but more important than the mounts is meeting the one and only Король Магни Бронзобород during Братья Бронзобороды. You have to do it, especially if you're a Дворф. По просьбе Гретхен Искрошип отправляйтесь в деревню Сифрельдар и спасите 5 плененных гоблинов. Вроде бы врайкулы, только кожа у них была голубая и как будто заиндевевшая... и среди них не было ни одного мужчины. Одни женщины! Они забрали всех наших мужчин, а нас, женщин, отпустили. Пожалуйста, <имя>! У нас есть подозрение, что их держат в Сифрельдаре – деревне, расположенной прямо над К-3. У тебя получилось! Наши мальчики вернулись!